During the university final exam week, students are stressed! 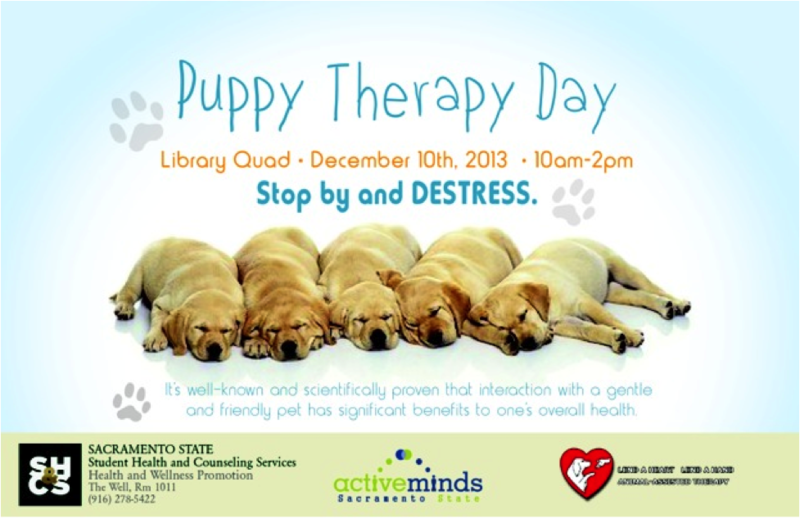 Therapy dogs are needed! Last week, Chou Chou and I went to off-campus housing for an event sponsored by Pets For Stress, a new student organization at the university. It was held in the lobby, and the club leader found a mattress for Chou Chou to rest on ("Very comfy!") while waiting for students to visit with her. Today, Chou Chou and I were on campus with 5 other teams. Puppy Therapy Day was sponsored by Student Health and Counseling Services. 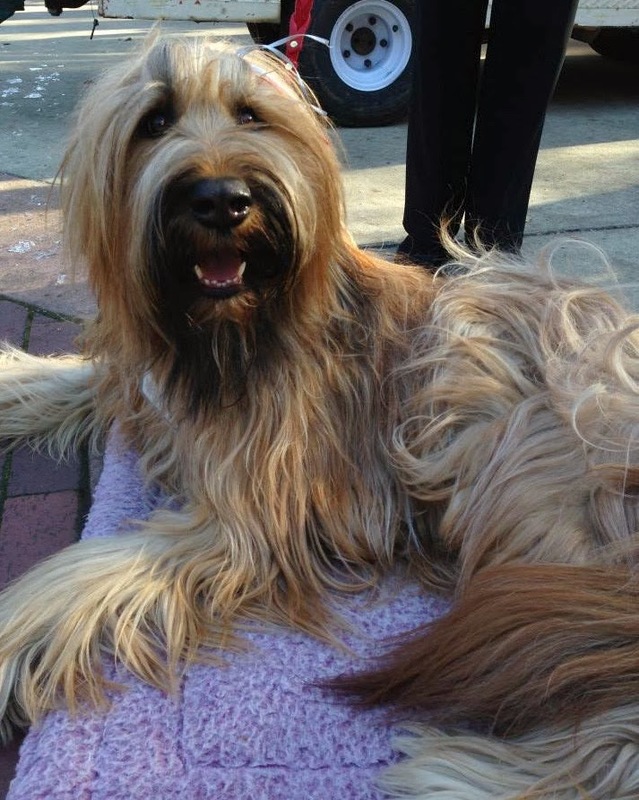 I am the Team Leader for California State University, Sacramento, therapy dog events. I haven't been at the university in a few months, and it felt good to be back; I parked in my usual faculty parking lot, near the psychology building, and walked over to the library quad. This was a four hour event. At libraries, after-school programs, and nursing homes, we only have one hour shifts. So Chou Chou sat on her crate mat that I brought from home and waited to be petted by students who needed de-stressing. And they came! The Student Health Services coordinator gave out fliers about the benefits of therapy dogs; she said she gave out 200 fliers in the first hour alone, so she estimates that 400 students participated in our event. The local newspaper and TV stations came, too. What could be a happier story for the nightly news than Puppy Therapy Day at the university? There were a lot of photos taken, too. A Communication Studies professor offered extra credit to her 130 students if they visited with the therapy dogs and took a photo of themselves with one of the dogs and the handler, and submitted it to her. That professor will have maybe 75 photos of Chou Chou and me! Another professor, from Environmental Studies, brought her class with her. She said she trains therapy dogs and wanted to show her class what these dogs do. And a 6th grade class from a local school came to the event, too. Many students wanted photos of themselves with Chou Chou, to show their friends what an unusual dog they saw today. ("And I'm cute!") Surrounded by students taking cell phone pictures, and professional photographers with large cameras -- click and flash -- you'd think Chou Chou was a famous model during fashion week. Participating in this event felt perfect to me: I spent my career as a professor giving exams and causing students to be stressed; now, with my puppy, I am a de-stressor! And I'm sure everyone liked me better in this role. Much more fun! When we got home, I made some hot chocolate for myself, to warm up. Then I went upstairs to take a nap. Chou Chou was already sound asleep in her bed.